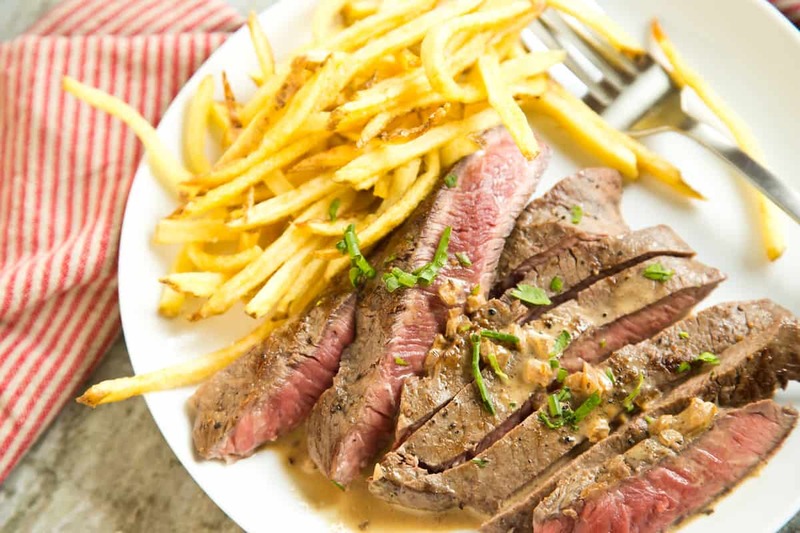 Steak Frites for Two in 30 Minutes | Good. Food. Stories. Year after year, one of my resolutions/wishes/hopes/dreams is to sneak a few nights onto the calendar where I’m not the one making dinner. 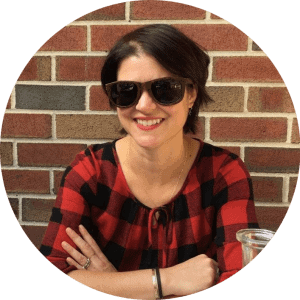 Don’t get me wrong; I have no problem being the primary cook in our two-person, two-cat household, and half the time we’re eating leftovers from my recipe development work, or we’re heating up meals at separate times and in separate places. But on those nights when we’re both at home and hungry at the same time, it’s a rare treat to have a meal where I don’t have to do all the prep, cooking, and cleanup. And though I have absolutely no problem dropping some coin on a restaurant meal, or just hanging out sharing apps and beers at a local bar, sometimes the allure of eating something truly decadent in my sweatpants is the most appealing option of all. 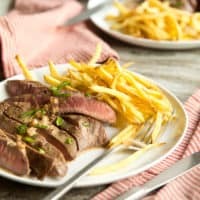 That’s where our favorite lazy evening-in date night dinner comes into play: my two-pan, two-person version of steak frites. We usually get our steak frites fix on the weekends, since that’s when Dan happens to have his nights off, but if you decide on a random Wednesday that you really need to fulfill your own steak frites fantasy, guess what? This is a totally doable weeknight dinner. The actual cooking part only takes about a half hour, with a few easy prep steps that can be done in the morning before you leave for work—or even the night before, if you’re that kind of planner. The trick to getting this all done in 30 minutes is that you need two people to divide up the tasks equally, making this a truly participatory date night dinner. No one gets to sit on the couch and watch TV while the other preps—while you can totally have a cocktail while you cook, you are both earning this meal. One person takes care of the steak, the other does the fries, and everything comes out restaurant-perfect. Yep, this means that one of you is going to deep fry those potatoes. And you’re going to do it on the stovetop, and you’re going to do it with only 2 cups of oil. I kid you not. If my complete nonprofessional cook husband can do this, so can anyone on this planet. While I love my electric deep fryer, sometimes the hassle of cleanup—especially if I’m only frying enough food for the two of us—outweighs the convenience of the equipment. That’s when I turn to stovetop deep frying, which I’ve started calling shallow frying because of the small amount of oil involved. First, you obviously won’t need as large and deep of a pot, since you’re only doing a small batch of fries, and second, a clip-on oil thermometer may not fit onto your shallow-fry pan. When choosing a pan to be your shallow-fry workhorse, look for a model with a smallish burner footprint—about 8-9 inches in diameter—and sides at least 3-4 inches high. Steer clear of regular frying pans and skillets, which don’t have the clearance on the sides to safely keep the oil splatter contained in the pan. My personal weapon of choice is the 9-inch DeBuyer Mineral B country chef pan. If you’d prefer something more Dutch oven-y, Lodge, Le Creuset, and Staub all make pots in the 2-quart range that fit the bill. As for the thermometer, it’s the only guaranteed way to make sure your oil has reached the correct temperature. Forget throwing a piece of bread into the oil to see how quickly it crisps, and ignore the folk wisdom of seeing how bubbles form around a submerged chopstick. We have technology at our disposal; let’s use it! 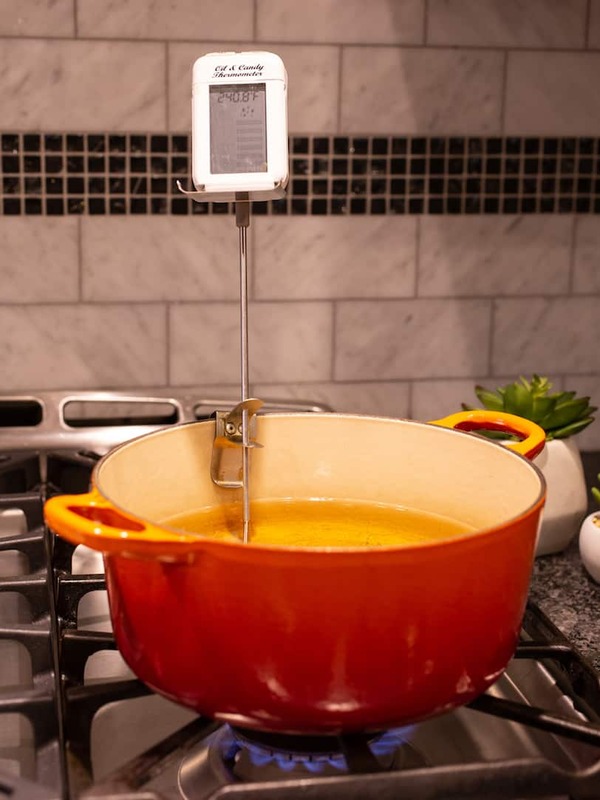 Grab a digital instant-read probe thermometer. You can splurge on a Thermapen or buy a less pricey model; just make sure it’s a version that has a thin probe that can easily be dipped in and out of the hot oil. Ready? Grab your partner, pick which half of the meal you’re going to make, and go to town. 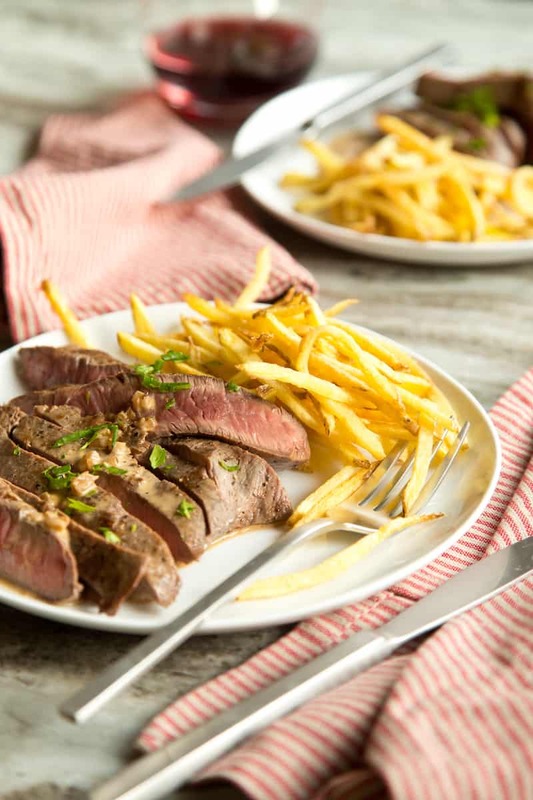 Grab your partner and make a decadent meal of steak frites for 2 people in just 30 minutes. It's a date night you both can get into! Submerge the sliced potatoes in water for at least 1 hour or up to 24 hours, until you're ready to fry. If you're using a flatiron steak, cut it into two equal halves to comfortably fit into a skillet (and also so both of you can have your own individual cut). Generously season the steaks on both sides with kosher salt. Heat a large (10- to 12-inch) cast iron skillet or other wide, heavy-bottomed pan over medium-high heat for about 4-5 minutes, until the pan is very hot. Pour 1 tablespoon oil into the pan and wipe lightly with a paper towel to cover the bottom and absorb some of the excess. You don't need to fry the steaks; you're just giving them a little lubrication. Carefully place the steaks in the pan. Cook for about 4-5 minutes per side, flipping once or twice, until the steaks have a gorgeous seared brown crust and are medium-rare inside. Check the temperature with a thermometer and pull the steaks from the pan at 130 degrees. Place the steaks on a rimmed baking sheet, tent with foil, and rest for 5 minutes, until the steak reaches 135 degrees. If you're using a thicker cut of steak like a strip or ribeye, see the Notes section below for recommendations on finishing your steak in the oven. To make a quick au poivre pan sauce while the steaks rest, reduce the heat to medium and melt the butter in the pan. Stir the shallots and pepper into the melted butter and cook for 1-2 minutes, just until the shallots are softened and taking on some brown color. Remove the pan from the heat and pour in the alcohol, then place back on the heat and cook, stirring, until it's mostly absorbed and evaporated. This won't take long at all; it might steam away almost immediately, depending on how much residual heat your pan is holding onto. Pour in the broth and cream and cook, stirring to scrape up the browned bits on the bottom of the pan, until the sauce is thickened to your liking. Drain and rinse the potatoes in a colander or strainer, then lift them onto a clean non-terrycloth kitchen towel and dry thoroughly. Wet potatoes = unsafe frying; the oil will splatter and it will hurt like a mofo. Trust someone who's been burned before. Pour 2 cups vegetable oil or canola oil into a high-sided cast iron or carbon steel pan and place over high heat. The oil should reach no higher than halfway up the sides of the pan; if you have a deeper pan, you may need the third cup oil. Let the oil heat to 375 degrees F; this will take anywhere from 5-10 minutes depending on the weight of your pan and the strength of your burner. While the oil heats, line a large rimmed baking sheet with a layer of paper towels. Place a wire cooling rack upside-down on the paper towels--the upside-down rack/paper towel combo wicks away any excess oil while keeping the food crispy. 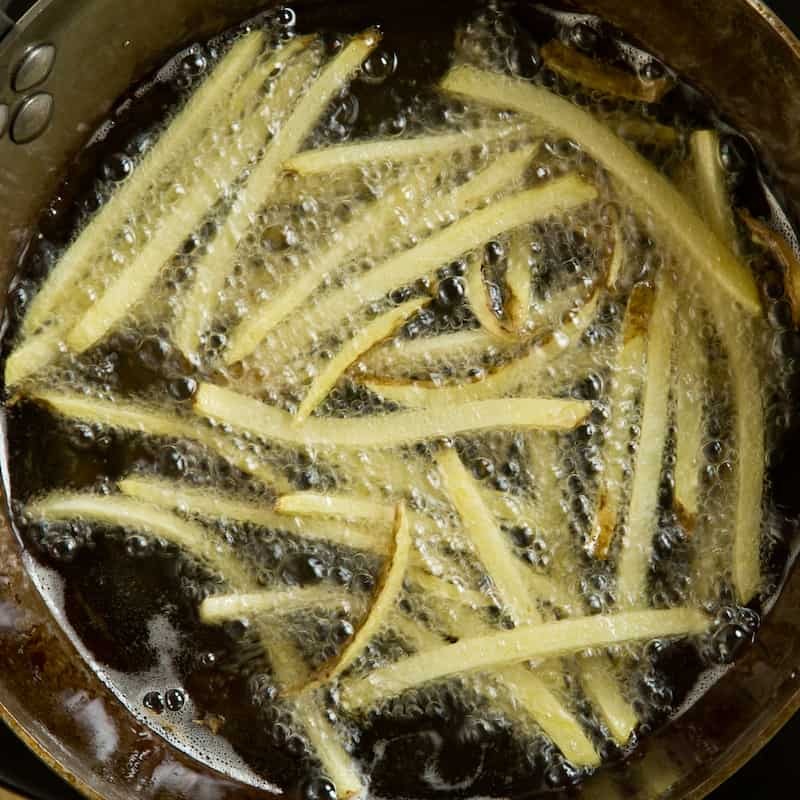 When the oil hits temperature, carefully add a handful of fries (probably about 1/4 of the entire batch) to the pan with tongs or a metal spider. The oil will bubble and its temperature will drop, so it's important not to overcrowd the pan. Cook, stirring occasionally, for about 5 minutes, until the fries are crisp and golden. Use the tongs or spider to transfer the fries to the baking sheet. Sprinkle generously with kosher salt. Let the oil rise back to temperature, then repeat with the remaining potatoes. Preheat the oven to 400 degrees F before you begin cooking. Sear the steaks in a cast iron pan on the stovetop for 4-5 minutes per side. Place the steaks on a rimmed baking sheet, tent with foil, and rest for 5 minutes, until the steak reaches 135 degrees.